I completely revamped my dan dan noodles and decided just to scrap the old recipe post and add a new one! My old one was just too complicated…This recipe for dan dan noodles uses mushrooms in stead of pork and is really pretty simple to make. Dandan noodles are a traditional Sichuan noodle dish made with chili oil, sichuan peppercorns, preserved vegetables, and sometimes sesame paste. I absolutely loved it, but I will confess that my husband, Tejas, was not a fan of the sichuan peppercorns, too bitter :-/. Sichuan peppercorns are so odd, they are peppery and a little bitter, and leave your mouth numb. I’m really starting to like them! Mix all ingredients together in a small skillet and heat up. Heat olive oil in a skillet and add the pickled mustard greens. Then add the mushrooms and cook until browned, adding salt part way through cooking. Cook noodles according to package directions and rinse with cool water. 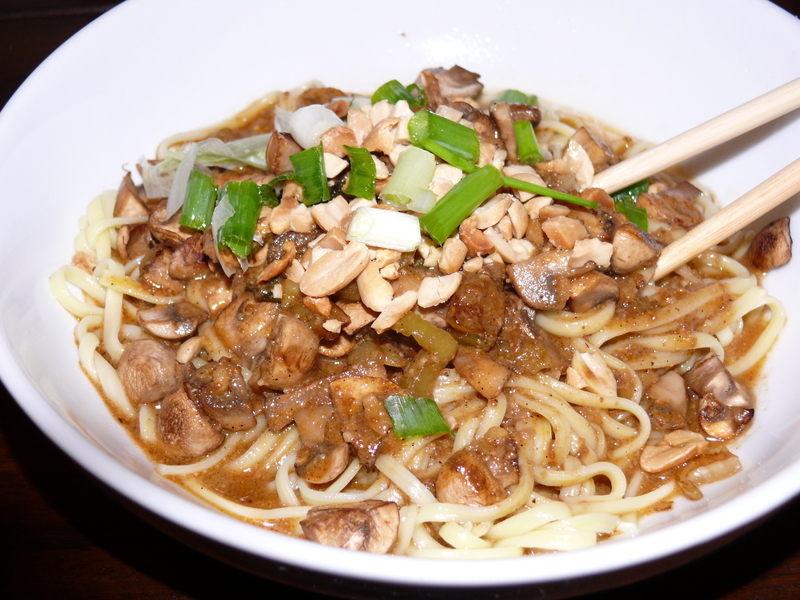 Take some noodles, top with the mushrooms, pour over the sauce, and garnish with peanuts and green onions.